Three-dimensional T®3 Plugs with a rectangular base are ideal for the repair of recurrent inguinal hernias in cases of significant destruction or weakness of the rear wall. Available in five different formats, with a soft or semi-rigid base, medium or large sized tip. the tip is connected to the base along the perimeter and, as it is made of a more rigid material than the base, it is not subject to shrinkage as a result of fibroblast action. the base reinforces the tissues surrounding the defect and, as it is sutured, helps to prevent recurrences deriving from plug migration. 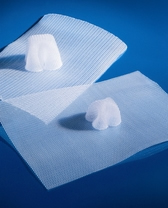 The larger base can be modelled by the surgeon to adapt to the area to be reinforced.